The Corporate Accountability Working Group of ESCR-Net (CAWG) participated in the second day of the third session of the IGWG. Following from yesterday’s panel discussion on the general framework of the treaty – covering preamble, principles, purpose and objectives – states and civil society made interventions on these topics. One of the critical issue for debate was the explicit recognition of the primacy of human rights; in response, several members stressed the need to acknowledge the primacy of human rights over corporate interests and pointed to international legal resources supporting this position. The IGWG turned next to the scope of the treaty, considering the rights to be covered by the treaty, and which acts and actors would be subject to its application. While there was generally consensus that the treaty should cover all human rights, participants considered the meaning of the term ‘business activity that has a transnational character’, and took varying positions on whether the treaty should apply to all corporations. Many CAWG members made oral statements, including KenRa, APWLD, Legal Resources Centre, Altsean Burma, Center for Constitutional Rights, ICJ, Franciscans International, FIDH, Corporate Accountability and PODER, highlighting the importance of community self-determination, the growing consensus that the treaty must focus on prevention as well as remedy, the need to focus on addressing current loopholes that allow impunity, and other key issues. 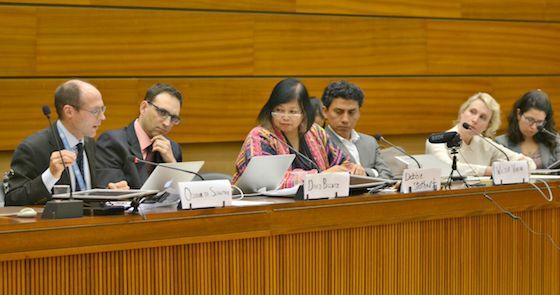 A side event organized by our member FIDH dealt with the scope of the treaty, during which APRODEH and Altsean Burma also brought their analysis on the subject. The afternoon session – focused on the proposed general obligations of states, corporations, and international organizations – began with a very diverse panel composed of Professor Olivier De Schutter, Ms. Linda Kromonj representing the International Organization of Employers, Professor David Bilchitz and Ms. Makbule Sahan, representing the International Trade Union Confederation. Key issues arising during initial state negotiations included: the need for further elaboration of the state measures needed regarding implementation (for example, of the framework for human rights and environmental impact assessments), the question of direct obligations for corporations, and the interaction between states and international organizations. IGWG program of work: general obligations (obligations of states, corporations, and international organizations), continued; preventative measures. Side event: ‘The cost of impunity: The cross-regional fight of affected communities and human rights defenders for effective remedies’. 1:30-3pm at Room XXII.